She has a real plan for coal country. Donald Trump has incoherent promises. Kenneth Bone, the undecided voter whose red sweater and earnest question about energy policy at the second presidential debate propelled him to sudden Internet fame, holds a common assumption about Hillary Clinton: that she’d be bad for coal country. “The big issue is that Donald Trump represents my industry in a more positive light than Hillary Clinton,” said Bone, who works at a coal-fired power plant in Illinois, in a later interview. “I would have more career opportunities and I’d be better [able] to take care of myself and my family under Donald Trump.” Trump made a similar argument during the debate, claiming that Clinton “wants to put all the miners out of business.” The notion that a Clinton administration would mean further economic ruin for Appalachia appears frequently in reporting on voters there. But is it actually true? The simplest way to understand the difference in the candidates’ approach on coal is that Trump wants to reboot the industry (by repealing environmental regulations), while Clinton wants to rebuild the communities that have historically depended on that industry, by diversifying their economies—to give people like Ken Bone career opportunities beyond the coal industry. Unfortunately, there’s been little room for a real comparison of their proposals amidst an outcry over an ill-phrased comment that Clinton made during an interview in March. Clinton was explaining her $30 billion coal-country revitalization plan; the plan was necessary, she continued, because “we’re going to put a lot of coal miners and coal companies out of business.” Clinton went on to say that she didn’t want to abandon “the people who did the best they could to produce the energy that we relied on.” But it was the first statement that made it into headlines, taken as evidence that she intended to destroy the industry. The truth is that there isn’t much left to destroy. The coalfield workforce has been shrinking since the Reagan administration, when mechanization began to displace workers. Coal mining employs fewer than 75,000 people now, down from nearly 180,000 in 1985. Job losses have been particularly steep in Appalachia because the richest coal seams there have been tapped out. As a result, production shifted to Wyoming’s Powder River Basin. More recently, the fracking boom has made natural gas a cheaper, more efficient alternative. Solar and wind power are increasingly competitive, too, and banks are backing away from financing coal projects. Trump’s promise to coal country is that he can reverse these trends. But his plan is based almost entirely on rolling back regulations, and new research from Case Western Reserve University makes it clear that doing so won’t make up for three decades of decline. The environmental rules that the coal industry has to contend with have been in place since President George H.W. Bush signed them into law in 1990; in spite of them, coal consumption continued to grow until 2008, when it dropped off steeply. Contra Trump, the drop didn’t have anything to do with the Obama administration’s proposed restrictions on carbon emissions, which haven’t yet gone into effect; nor with stricter limits on mercury pollution, which were only approved by the Supreme Court in June. The data examined by the Case researchers indicates that the driving force behind the decline in coal-generated electricity was not EPA rules but instead the dramatic increase in natural-gas production. If Trump really wanted to bring back coal, he would ban fracking. Instead, he wants to boost natural-gas production. If Trump really wanted to bring back coal, he would ban fracking. Instead, he wants to boost natural-gas production by loosening regulations on that drilling technique. “The shale energy revolution will unleash massive wealth for America,” Trump boasted recently during a speech in Pittsburgh. (As The New York Times noted, most fracking activity is regulated at the state and local level, so it’s not clear that repealing federal rules would have much of an effect.) There’s also no reason to think that tinkering with the domestic regulatory structure will fix the global coal market, where prices have fallen steeply, and demand is slackening. In China, coal consumption is expected to peak within a decade. While Trump panders, Clinton is offering a kind of bitter medicine. She acknowledges that those coal jobs are not coming back, and her (long, detailed) plan is based on the idea that something should be done for the communities they supported. Her $30 billion package includes grants for small businesses, community health centers, and local housing programs; financing for infrastructure, expanding broadband access, education and retraining, and local arts and culture programs; and tax incentives for investment. Much of this would require buy-in from Congress, and years of work—but that’s true of most ambitious public policies. What Clinton is proposing would build on “just transition” work that is already underway in coalfield communities. 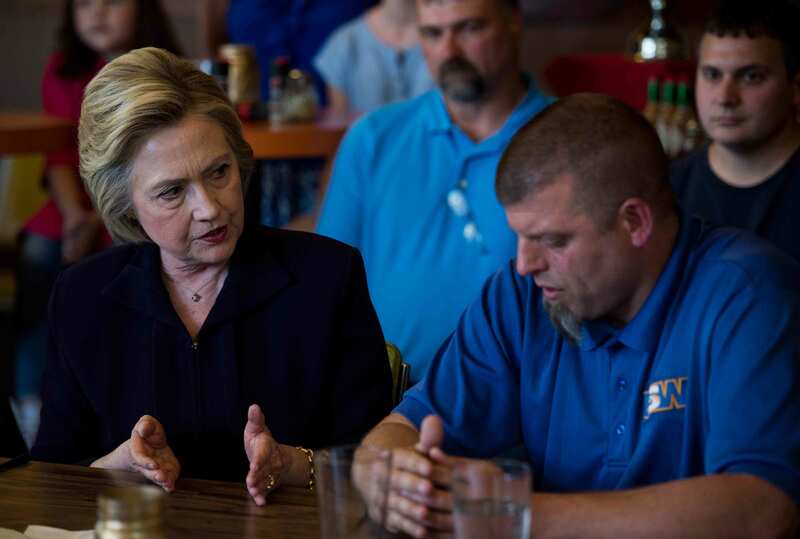 Clinton supports another key policy to help coal workers take care of themselves and their families: legislation to ensure that retired miners receive their pensions and health benefits. Several major coal producers in bankruptcy have tried to drop commitments to their former employees—while providing executives with hefty bonuses—leaving the benefit funds strapped for cash. In response, a bipartisan group of senators has proposed shifting money from a fund for mine cleanup to keep them solvent. Though the legislation has support from the United Mine Workers of America and a number of other groups in coal-producing states, it’s been held up multiple times by Senate majority leader Mitch McConnell, the staunchly pro-coal Kentucky Republican who warned recently that “the country must not turn its back on Kentucky coal miners.” As for Trump, he’s ignored the benefits crisis completely. Without congressional action, some 12,500 retired union coal miners will lose their health care on New Years’ Eve. Without congressional action, some 12,500 retired union coal miners will lose their health care on New Years’ Eve. “We’re dying like flies,” a miner named Billy Smith told the Associated Press earlier this month, speaking of his fellow retirees. That’s the dirty secret about the coal industry that its defenders never mention: Big Coal has never been all that good to its workers, nor to the communities on the mining front lines. When Trump talks about restoring the industry, does he mean sentencing another generation to suffocate slowly from black-lung disease, to die in mine explosions and from lung cancer, and to drink poisoned water? Even while the industry was booming, comparatively little wealth made it back into the communities it was extracted from. Coal bosses like Don Blankenship made millions by exploiting their employees, breaking their bodies and their unions. That’s not to say that no jobs are necessarily better than dangerous jobs. But even some of Trump’s own supporters within the coal industry, like Murray Energy CEO Robert Murray, acknowledge that Trump is over-promising, and the lost jobs aren’t coming back. What does Trump have to offer the families of out-of-work miners then? Ken Bone may be correct that Trump paints the coal industry in “a more positive light” than Clinton. (Though she’s offered plenty of praise for coal-sector workers like Bone, “the hard-working Americans who mine, move, and generate power from coal [and] put their own health and safety at risk.”) But it’s an irresponsible positivity. Unserious promises to restore the past, “to bring the coal industry back 100 percent,” make it impossible to talk about coal country’s future.